On July 29, 2018, at 1205 eastern daylight time, an experimental amateur-built SeaRey amphibious airplane, N221EZ, sustained substantial damage when it collided with a tree then water while attempting to land on the Connecticut River, near Haverhill, New Hampshire. The private pilot/registered owner and the passenger were seriously injured. Visual meteorological conditions prevailed, and no flight plan was filed for the personal flight conducted under the provisions of Title 14 Code of Federal Regulations Part 91. The flight originated at the Laconia Municipal Airport (LCI), Laconia, New Hampshire, about 1100. The pilot stated that he had made two successful water landings on the river and was preparing to make a third landing up-river to join a friend who had already landed and beached his SeaRey. After he took off, the pilot initiated a left "teardrop" turn over a flat cornfield to make a 45° re-entry to the river at an altitude of 50 ft above ground level. The airplane had crossed over the shoreline, when the pilot attempted to turn left and line up with the river; however, the control stick would not move past the vertical position. The airplane would not turn, and was approaching 60-foot-tall trees on the opposite bank of the river. The pilot added power, but the airplane collided with a tree, and impacted the river in a nose down left-wing low attitude. The airplane was retained for further investigation. The pilot held a private pilot certificate with a rating for airplane single-engine land. His last Federal Aviation Administration third-class medical certificate was issued on December 20, 2017. The pilot reported a total of 760 flight hours; of which, 498 hours were in the accident airplane. At 1100, weather at LCI was reported as wind from 290° at 6 knots, visibility 10 statute miles, scattered clouds at 4,000 ft, temperature 81° F, dew point 75° F, and an altimeter setting of 30.04 inches of mercury. 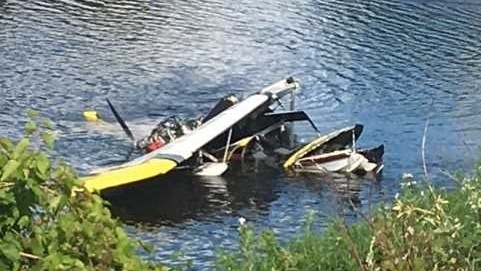 HAVERHILL — Two people were injured — one seriously — Sunday afternoon when the small plane they were flying in crashed into the Connecticut River. The FAA is investigating the crash, Breitenfeldt said. According to New Hampshire State Police, the aircraft was carrying one pilot and one passenger, who were both injured. One occupant was transported by helicopter to the Dartmouth-Hitchcock Medical Center with serious injuries, but was in stable condition Sunday night. The other occupant was transported by ambulance to Cottage Hospital in Woodsville. The plane came down near the Harkdale dairy farm in Newbury, Vt., just across the Connecticut River from Haverhill. Mary Carson owns and operates the farm with her husband Russell. Carson said the DHART helicopter landed in one of her farm’s pastures to pick up one of the crash victims. Staci Huckins of Troy said she was part of a 24 mile paddling trip along the Connecticut River, going from Monroe to Haverhill, when the crash occurred. State police said a pilot traveling in a similar aircraft and a tour helicopter from the nearby Haverhill Fair, along with Newbury, Vermont fire personnel and Vermont state police provided assistance at the scene. Anyone with any information about the crash is asked to contact Trooper Alex Peplinski at 603-227-0076 or alex.peplinski@dos.nh.gov. 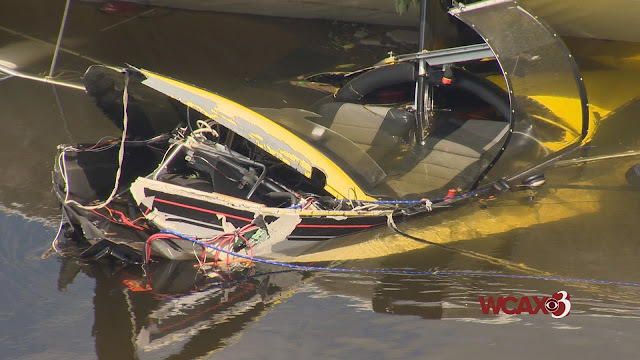 HAVERHILL, N.H. — A small plane crashed in the Connecticut River Sunday afternoon, injuring two people. According to the Federal Aviation Administration, a Searey aircraft crashed at 1:20 p.m. in the river near Haverhill. Authorities said the pilot was trying to land in the river, but crashed. New Hampshire Fish and Game said that the two people on board were removed from the plane. One of them was taken by helicopter to Dartmouth Hitchcock Medical Center with serious injuries. That person is currently in stable condition. The other occupant was brought by ambulance to Cottage Hospital in Woodsville. The plane is currently at Harkdale Farm on the Newbury, Vermont, side of the river. The owner of the farm told News 9 his father was clearing the fields when the plane went down. "We had no clue what was going on,” said Steve Carson of Newbury. Carson was taking a lunch break and said he never heard or saw the plane come down. "First responder trucks, state troopers and an ambulance screamed down the road and headed down to the meadow,” he said. Carson's dad was working in the fields by the river and he thought maybe something happened to him. But he never expected to come across the mangled mess of a plane wreck. "He just heard something thud, is what he said. He didn't see much, and he continued on to another part of the field,” Carson said of his dad. The farm owner said the plane will remain on his property overnight and will be retrieved Monday. 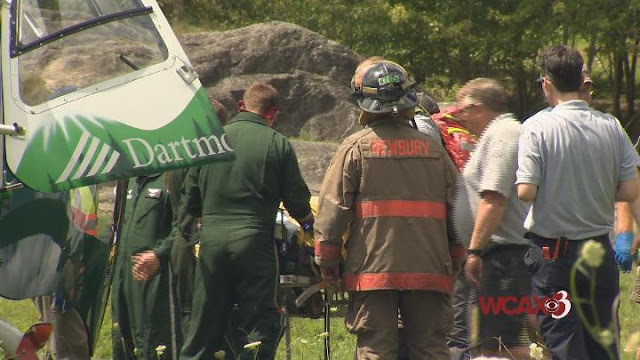 NEWBURY, Vt. (WCAX) Police are investigating a single engine plane crash, into the Connecticut River, that sent two people to the hospital. Witnesses say the crash happened around noon on Sunday near a farm just off of Route 5 in Newbury. Police say the amphibious experimental aircraft was attempting to land in the river at the time of the crash. Two people were on board. One of the victims was transported by a DHART helicopter and the other was transported on the ground. The names of the two people involved have not been released. The person with more serious injuries was last listed in stable condition. 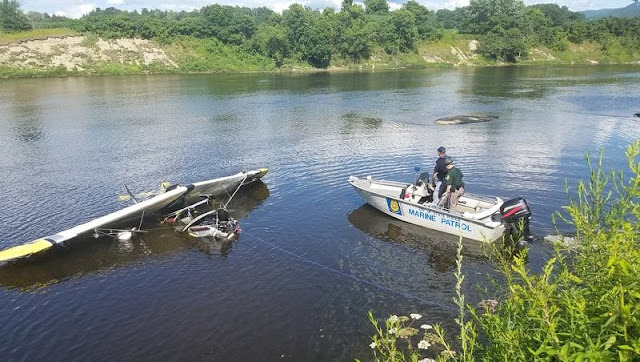 New Hampshire State Police are investigating the incident because the plane crash happened in the Connecticut River which is New Hampshire jurisdiction. "I was finishing up my lunch and i heard the planes," said the farm's owner Russell Carson. "I heard the engine and all the sudden there was a thud. Then the first thing I saw was a helicopter trying to find something in the river, he was flying over the river real low." A pilot traveling in a similar aircraft and a tour helicopter from the nearby Haverhill Fair, along with the Newbury Fire Department and Vermont State Police provided assistance at the scene. At this time we are still waiting for additional information on how the plane crash occurred. The Federal Aviation Administration is investigating.